This recipe can be found here. We love this meal! I have even made this with two fresh tomatoes instead of the can of diced tomatoes. Cut the squash in ½ and scrape out the seeds. Season the squash with olive oil, salt and pepper. Bake the squash for 1 hour or until tender. While the squash is cooling, cook the sausage over medium heat in a skillet. Shred the inside of the squash with a fork. 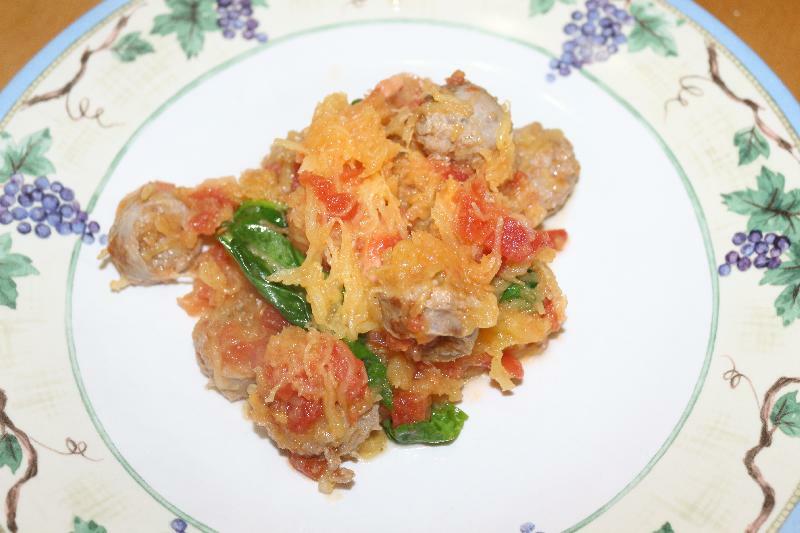 Toss the spaghetti squash into the skillet, add the tomato, the garlic and cook for 2-4 minutes. Next add the spinach until it wilts.